British duo Owain Doull and Jon Dibben excelled as Team Wiggins dominated the Revolution Series event in Glasgow. Welshman Doull and England's Dibben won four of five races in the Elite Championship to move to within 19 points of leaders Team Pedalsure. 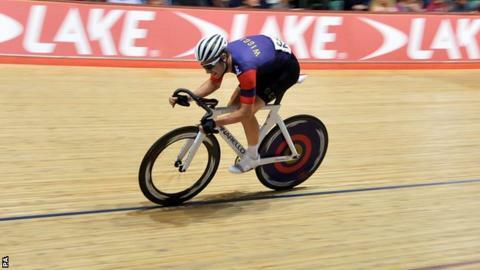 Double Olympic champion Laura Trott won the women's points, elimination and the scratch race ahead of Katie Archibald. The event is the fourth of six in the series, with two one-day competitions to come in Manchester in January. Team Wiggins was formed by 2012 Tour de France winner and four-time Olympic gold medallist Sir Bradley Wiggins specifically to help him compete for qualification for the Rio Olympics. Doull and Dibben were beaten in the first race of the evening as Australian Sam Welsford, riding for Orica-GreenEdge, took the 250m flying lap in 13.053 seconds. However, the pair then won the remaining quartet of races - the points, scratch, Madison time trial and team elimination. Doull admitted on the Revolution Series official website that his team had "a bit of an advantage given that we have access to the track quite a lot in Manchester". "With the Worlds [Track Championships] only a few months away we're all in really good shape, which definitely helps," he added. Trott, 23, who won three titles at the European Track Championships in Switzerland in October, was again in fine form, completing a clean sweep of the women's endurance events. There was also success for a British rider in the women's sprint competition as Victoria Williamson beat France's Melissandre Pain in the final.